Exercise is beneficial to every living creature and most humans and animals perform a variety of different activities and exercises throughout the day. Movement is essential to life, as is proper fitness. Core strength, in particular, is essential for proper posture and development. Every dog may benefit from core exercises and the benefits should help them to live the best quality life for the longest time possible. Whether your dog is a professional couch surfer, your faithful walking companion, a senior starting to lose their muscle mass and balance, or a competitive performance dog, maintaining core strength is an essential component of a healthy, sound life. The good news is: Core fitness exercises are fun and easy to integrate into your dog’s daily routine. The core muscles consist of the large postural muscles of the stomach, spine, and limbs. These core muscles are the literal CORE of the body. In humans, our core strength allows us to maintain upright posture, sit and stand straight, and aids in preventing injuries. One of the most common problems in humans is lower back pain. Proper core, abdominal and back strength is something everyone can improve to decrease the incidence and intensity of lower back pain. In dogs, core strength helps decrease the incidence of spinal pain, and a strong core reduces the probability of iliopsoas strains and soft tissue injuries, as well as injuries associated with osteoarthritis. Strengthening core muscles in dogs with neurological issues is necessary to support and safeguard the spine. In addition, core fitness is a fantastic component of cross training for active dogs. 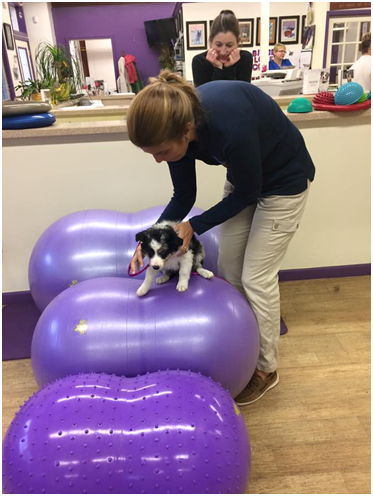 Core fitness also helps puppies develop their strength, balance and proprioception which enables them to conquer all of the obstacles in their growing world. Older dogs begin to demonstrate losses of balance and proprioception as they walk across a slippery floor or take a turn too quickly. Dogs with soft tissue injuries, such as iliopsoas strains, often suffer from lack of balance and proprioception and require these skills to return to a normal activity level. Dogs with osteoarthritis often have difficulty standing due to the pain and inflammation associated with the disease process. Part of the multimodal approach to improving a dog’s quality of life in these circumstances is reducing pain and inflammation while concurrently working on strength and function. Core fitness is essential for any dog with osteoarthritis. Dogs suffering from neurological issues, such as intervertebral disc disease or Degenerative Myelopathy, require core strength to protect the spine, as well as improve their quality of life by maintaining postural control for as long as possible. Core fitness exercises are easy to perform with any dog – whether eight weeks of age or eighteen years of age. In my experience rehabilitating and conditioning thousands of dogs, I have worked on core fitness with every single one of them. An agility dog requires optimal core strength to safely take the jumps without knocking bars or injuring themselves. A dog involved in conformation requires optimal core strength to help maintain their posture and endurance as they move around the ring, and hopefully progress to best of breed and beyond. Herding dogs, working dogs, performance dogs, YOUR dog – all will benefit from improved core strength and balance. Five to ten minutes of core exercises a day can make all the difference in the world for your dog. It will increase confidence and teach the dog how to safely control its movement. Improved core strength may also make the difference in living a life without pain for your dog. In addition, you will be taking a positive step to help your dog live the best quality of life possible. Stay tuned for next week’s blog where I will explain how to do 5 Basic Core Exercises in your home without any special equipment: Keeping it Simple. Keeping it Safe. Great info. Looking forward to more! I enjoyed reading this and am looking forward to future posts. Thank you, looking forward to following the blog ?